My body is in safe hands as I submit to treatment on a Canyon Ranch spa at sea. World of Spas Editor Jo Foley reports from Celebrity Equinox. Dr Om has a very steady hand…which is exactly what you hope for when somebody is popping tiny acupuncture needles into your feet, hands, back, and crown of your head as you surge across the Adriatic towards the Croatian coast. 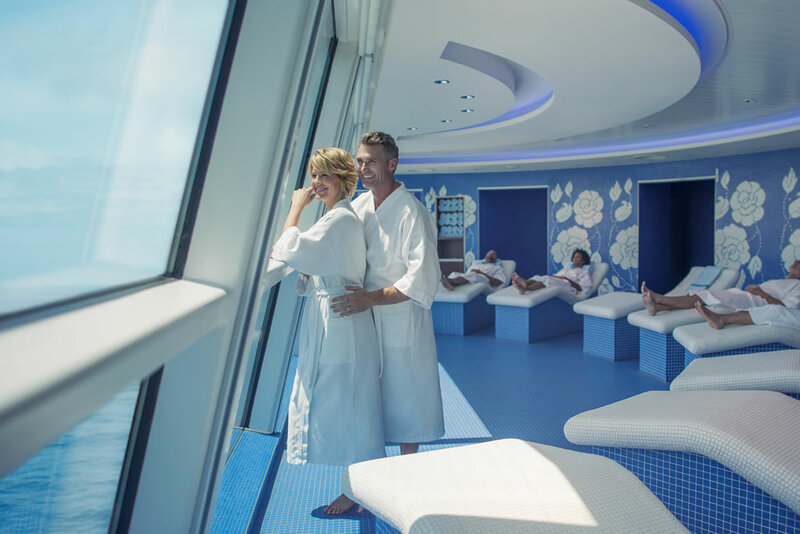 Dr Om is the gentlest star of the new Canyon Ranch SpaClub which was launched last autumn and features on 10 Celebrity Cruises ships. Canyon Ranch is a byword in well-being, as its original spa in Tucson, Arizona has been soothing the stressed, exercising the unfit and helping countless creatures lose weight for more than 30 years. Latterly it has branched out with spas in resorts and at sea, and this three deck wonder with its 27 treatment rooms, gym, fitness studio and Persian Garden relaxation lounge complete with speciality showers and aromatherapy steam room, plus hair, beauty and nail parlour, showcases exactly what a spa at sea can do. Dr Om had never been to sea, in fact had never seen the sea until he joined the ship last year. A native of Nepal – not just a land-bound country but a one encased by mountains, surrounded by the Himalayas – he is enthusiastic about all the benefits the sea, its waters and its air can bring to our health. Add to that his medical training and his acupuncturist skill and you know that your body is in safe hands. His initial consultation told him that my ‘computer’ neck and shoulder problem coupled with lower back pain caused by sitting at a desk for too long, needed not just acupuncture but also acupressure massage and daily stretching exercises. He is just one of the many specialists available at the spa; there are chiropractors, yoga teachers, fitness trainers and nutritionists as well as a host of beauty therapists to pamper and cosset your face and body. Treatments and programmes draw on the wealth of traditional practices and knowledge from both east and west as well as the latest in modern research and technology. So, for instance one day you may well enjoy an 80 minute Ayurvedic Abhyanga massage with warm herb-infused oil or a traditional Thai massage which is tantamount to someone doing yoga with your body, and the next you can book a state-of-the-art MediPeel facial which helps reduce the appearance of wrinkles and gives a firmer, smoother look to the skin. Two signature treatments are the Canyon Ranch hot stone massage – as this is the spa that invented it, and the Gait analysis. The former uses the weight and heat of basalt stones for a firmer massage to help relieve tight muscles and limbs, while the latter uses a video analysis of how our feet work when walking to give a computerised assessment of how to improve posture and flexibility where necessary. Our movement and weight distribution changes as we get older, and this is an ideal way of coping with aches, pains and foot, ankle and knee problems. Follow this with one of luxury pedicures and you are ready to dance the night away. Should you want just a simple massage then there is a menu of them from aromatherapy to deep tissue to lymphatic drainage, while the body wraps and scrubs use not just sea salt and seaweed but also such exotica as ginger, lime oil and bamboo sap to nourish and pamper. There are special facials for men as well as teens alongside the more usual deep-cleansing, age management and the high tech oxygen boost. 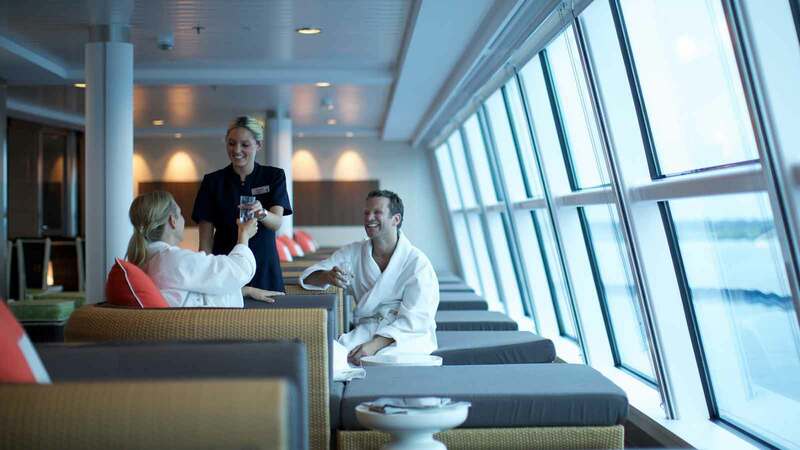 In fact there is such a choice of treatments and therapies that you can spend all your cruise time in the spa – hence the (adults only) AquaClass staterooms, with their special pillow and aromatherapy menus as well as body wash showers and unlimited access to the Persian Garden area. This is a real hedonist’s haven with its steam rooms, heated loungers, ice fountain and sensory showers – it’s where you go to unwind before a treatment or relax after one, while some guests have been known to spend most of the day in the luxury relaxation area with its expansive views of the surrounding ocean. Whatever your choice, or whatever you need – from a full body composition analysis to a true fitness assessment, whether you want your teeth whitened or your nails painted, your body oiled or your hair dried, plus all the health giving benefits of sea air and sunshine – Canyon Ranch SpaClub provides it. No wonder Dr Om is enchanted.